A narcissist and an empath are opposite personalities, they share a hurt and heal relationship which is always toxic. The empaths think that they have power to change world full of narcissists, in fact, this is not reality and they end up hurting themselves. A narcissist is on a constant war with anyone opposite to them. Though, they have a history of emotional trauma and a struggle with incessant pain, but they don’t spare a single person from hurting or controlling their lives. They become cold stone due to the consequences they have gone through, nothing matters to them due to a lot of suffering in their past so they don’t give a damn to someone else’s suffering, nonetheless, they don’t care at all if someone repents or burns in sorrow. Their thirst of constant validation and praise can hardly assuage thus, they make peoples’ lives a living hell. Empaths are entirely opposite to narcissists, they are species from another planet. Their heart is brimming with care and love for other people, no matter the other person has hurt them in a terrible way. They would try to fix people who are suffering from trauma or pain and this is why they get most emotional injuries in the process. 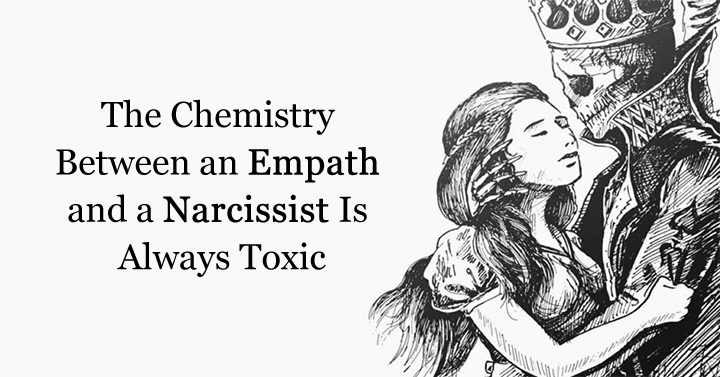 Their chemistry is always toxic and the relationship could turn into a dangerous cycle with negative consequences, mostly for empaths. The empath always becomes the victim because they give love and affection while, on the other side, narcissists gain more control on their lives. Eventually, their bond becomes poisonous and doesn’t end well. It becomes rather complicated for an empath to deal with a narcissist who would absorb the energy from everyone they interact with. They feed on other peoples’ fragile ego hence, the empath might not even realize that they are being played and controlled by another person. Their relationship could not find a balance because there are two different attitudes and one-sided love. Empaths become the victim of influencing narcissists and even compromise on their self-worth. The tricky moment arises in their relationship when the empath would try to find a validation about love and affection of the narcissist, without knowing that a narcissist is an actual culprit. An empath’s vulnerability is the narcissist’s triumph. Empaths live in a fantasy of changing the narcissists and bringing them back to feel emotions and love. This might be futile because the narcissists manipulate every fragment of one’s life and their charming personality gives them an advantage of hurting others. They play with the emotional strings of empaths and blame them for their own struggling and pain. The empath has to take the decision, whether they stay in the relationship as a victim or end it. The empath needs to accept the reality that they can’t change the narcissist so, they shouldn’t be wasting their time and effort on false expectations. They need to understand that they are worthy of love and not suffering from their counterpart. Further, it’s important for everyone to understand that giving control to the other person over your own personality is taking your ability to stand for yourself and fight for your self-worth. You have to bear the consequences if you choose to continue the toxic relationship. It’s good to have compassion and a soft heart for others but it’s not the empath’s responsibility to make others feel complete. Sooner they end their relationship with the narcissist, less will be the pain afterwards.